Ratchet straps are available in many sizes and styles. We offer a securement straps for any type of tie down. 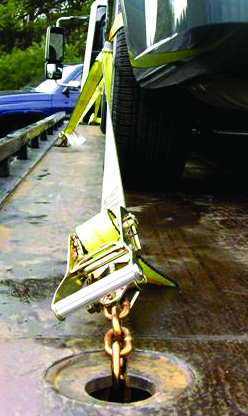 Ratchet straps are often used on flatbed trailers, car haulers, rollbacks and interior van trailers in the L-track and E-track systems. Our standard locking ratchet strap assemblies are made from high strength durable polyester webbing. Custom configurations are available. Just tell us what you need and we'll build it. We can use any size strap, ratchet and fitting. Buy in bulk and save! Call us at 1-866-490-7278 if you need assistance finding the right strap for your job. 1" Ratchet Straps - 1" ratchet straps come with with S hooks, J hooks, D-rings, flat snap hooks, spring action buckles and more. 2" Ratchet Straps - 2" ratchet straps are not only used with E-track or L-track they are commonly used for flatbed trucks and trailers, enclosed trailers as well as auto hauling. 2" ratchet straps come with wire hooks, flat hooks, snap hooks, chain extensions and many other combinations of fittings. 3" Ratchet Strap - 3" ratchet straps provide break strengths of up to 15,000 pounds and are made for the heaviest of jobs. 3" ratchet straps are available with chain extensions and either flat hooks or double-J hooks. We also carry Velcro CORDURA® protective sleeves for webbing this tough fabric offers a layer of durable protection to the webbing, to help extend the life of your straps. 4" Ratchet Straps - 4" ratchet straps are also provide break strengths of 15,000 pounds and over. 4" Ratchet straps are also available with chain extensions.